MEIKAKU-KAI was founded with 11 original members headed by MAEKAWA, Nobuo shihan. The first Aiki seminar was held in Urasoe, Okinawa. 2nd Aiki seminar was held in Urasoe and Naha, Okinawa. Meikaku-kai Journal (1st edition) was published. Opening ceremony for the Kyoto head dojyo was held. Meikaku-kai Journal (2nd edition) was published. The first joint Aiki seminar was held with 25 Meikaku-kai members and 20 Taiwan participants in Taipei. Meikaku-kai Journal (3rd edition) was published. The calligraphic hanging scroll “天人合一” written by Former Taiwan President, Lee Teng- hui was honorably presented to Maekawa shihan. 2nd joint Aiki seminar was held in Kaohsiung. The first Kyoto head dojyo seminar (Gassyuku) was held. Aiki demonstration was performed by Maekawa shihan for the students of Kubasaki High School in US military base, CampFoster, Okinawa. Meikaku-kai Journal (4th edition) was published. 19 members headed by Maekawa shihan honorably met Former Taiwan President, Lee Teng-hui at Taiwan Research Institute in Tamshui. The lecture about “Bushido” by Former President Lee for over two hours gave the members deep spiritual impacts. Meikaku-kai Journal (5th edition) was published. 2nd Kyoto head dojyo seminar (Gassyuku) was held. Aiki seminar for the aikido instructors in Taiwan was performed by Maekawa shihan at Chang Hang-tong dojyo in Sanchung. Aiki demonstration and seminar were performed by Maekawa shihan for the students of Kubasaki High School in US military base, Camp Foster, Okinawa. 3rd Kyoto head dojyo seminar (Gassyuku) was held. Aiki demonstration and seminar were performed by Maekawa shihan for the R.O.T.C students of Kubasaki High School in US military base, Camp Foster, Okinawa. 4th Kyoto head dojyo seminar (Gassyuku) was held. Aiki demonstration and workshop were performed by Maekawa shihan for the Aiki-club students of Kubasaki High School in US military base, Camp Foster, Okinawa. At that time, Maekawa shihan was honored by the Principal of the school for co-operating their educational activity. International Aiki seminar was held in Suzhou, China. At this seminar, Maekawa shihan trained some members of German community on that area. International Aiki seminar was held in Oroshaza, Hungary. At this seminar, Maekawa shihan trained 17 members of local aiki-do society on that area. 5th Kyoto head dojyo seminar (Gassyuku) was held. International Aiki seminar was held in Brazil. At this seminar, Maekawa shihan trained a good many people of local aiki-do societies in the country. International Aiki seminar was held in Budapest and Szeged, Hungary. 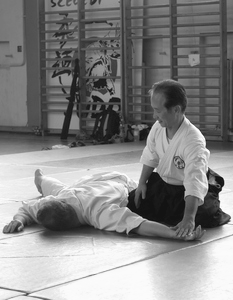 At this seminar, Maekawa shihan trained 40 members of local aiki-do society on the area. 6th Kyoto head dojyo seminar (Gassyuku) was held. International Aiki seminar was held in Budapest, Hungary. At this seminar, Maekawa shihan trained 23 members of local aiki-do society on the area. 7th Kyoto head dojyo seminar (Gassyuku) was held. MEIKAKU-KAI attained its 10th year since the establishment. By this seminar, Maekawa shihan established a strong relationship between the local Aiki enthusiasts. The 10th year Anniversary Meikaku-kai journal was published. 8th Kyoto head dojyo seminar (Gassyuku) was held in Kyoto. 10th Anniversary Ceremony was held in Kyoto. At the ceremony, the late Professor Mineo Nakajima was invited as Guest Speaker. Akita Seminar was held inviting the late Professor Mineo Nakajima. 9th Kyoto head dojyo seminar (Gassyuku) was held in Kyoto. International Aiki seminar was held in Berlin, Germany. 10th Kyoto head dojyo seminar (Gassyuku) was held in Kyoto. Meikaku-kai journal, 2013 Autumn Special Edition-In memoriam; Professor Mineo Nakajima was published. 11th Kyoto head dojyo seminar (Gassyuku) was held in Kyoto. Maekawa shihan was inaugurated as the President of the Kyoto Aikido Federation. Maekawa shihan had Aiki demonstration and Aikido seminar at the Kyoto Aikido Federation Annual Meeting. 12th Kyoto head dojyo seminar (Gassyuku) was held in Kyoto. MEIKAKU-KAI attained its 15th year since the establishment. Maekawa shihan was invited to the All Japan Doctors’ Kendo Federation Annual meeting and had Aiki demonstration. The 15th year Anniversary Meikaku-kai journal was published. 13th Kyoto head dojyo seminar (Gassyuku) was held in Kyoto. 15th Anniversary Ceremony was held in Kyoto.